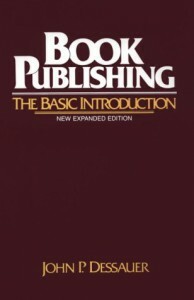 Book Publishing: The Basic Introduction, John P. Dessauer, Continuum, 1996 (c1989), ISBN 0-8264-0621-1, $19.95, 260pp. But the most interesting part for me, and I think a section worthy of the attention of any serious reader, is the section on the manufacturing of books. From picking the type of paper, to the details of binding and printing, there is a lot more that goes on in the making of a book that was previously dreamed of in my philosophy. I finally understood the distinction between a hardcover and a trade paperback (both of them are printed from the same plates; the only difference is that one is put between hard boards and the other gets a paper cover), as opposed to the mass market paperback (which requires a separate set of printing plates from the hardcover edition). After reading this section, I look at a book quite differently–admiring the amount of labor and ingenuity that went into the object itself, quite beyond the words it contains. Book Publishing is a little dry at times. Dessauer was once principal author of Book Industry Trends, and sometimes floats by a bunch of tables filled with numbers and doesn’t go into much discussion about them. For research purposes, these facts are wonderful, but numbers are rarely equal to words when trying to learn something. All in all, I found this an invaluable book to have read, and plan to keep it for a little while as a reference work.